Adhesive Picture Hang Tab - 2" x 2"
Looking for a simple way to hang up photos, signs, or other promotional materials? 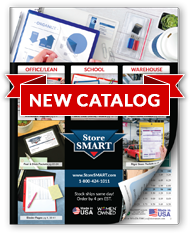 Try one of StoreSMART's Adhesive Picture Hangers! The pre-installed permanent adhesive on each hang tag makes it quick and easy to affix to plastic, glass, cardboard, or other materials, and they assemble in seconds without messy glue. Use them at work, conventions, meetings, and in the home. Made of frosted heavy duty plastic. Overall Size 2" x 2" with 1 ¾" x 2" Adhesive section. Apply our hang tags to signs, photos, promotional materials, and more. Just bend back the hanger, peel the tape off the pre-installed permanent adhesive strip, center the item you want to secure, and press firmly into place and hang onto your hook or nail. No glue required. Nail or Hook not included. Hangers cannot be repositioned or reused. For indoor use only.